Rogers High School teacher George Roth assists sophomore Taylour Freeland with her social studies assignment during "ROW time," a 30-minute study hall made possible by a $3.7 million federal grant. It's lunchtime, but Bailey Hicks, a Rogers High School freshman in a baggy San Diego Chargers sweatshirt, isn't in the cafeteria. Instead, he's in a classroom, thumbing through Romeo and Juliet as an intervention specialist helps him translate passages from iambic pentameter into modern English. There's just over a week of school left, but Hicks has been fighting to get his grades up in Biology and English. His goal isn't just to avoid summer school, it's to eventually go to college. "I want to go to Whitworth," Hicks says. "My family believes that I couldn't go there, and I want to prove them wrong." At one time at Rogers, kids like Hicks may have fallen through the cracks. But in the fall of 2011, everything changed. Today, the school day runs 30 minutes longer. The extra half-hour became a mandatory third-period study hall called "ROW time" (Responsibility, Ownership, Willingness). Students finish homework, retake tests and get one-on-one tutoring. On top of that, intervention teachers use the school's data dashboard to find students with missing assignments and summon them to an extended ROW classroom to work through lunch. The students around Hicks are hammering away at math retakes, persuasive essays, world history assignments, dialectical journals and papers on Antigone and To Kill a Mockingbird. Rogers' $3.7 million federally funded grant made this possible. It's allowed Rogers to extend its school year by two days, and given the school more administrators, counselors and specialists. The goal of the 2011 School Improvement Grant was ambitious: Take a school where only half of the students graduated, and somehow bring that rate all the way up to 85 percent. "At the time, we were one of the bottom 5 percent schools in the state of Washington," Rogers Principal Lori Wyborney says. "Totally failing." Today, fights are down, Fs are down and attendance is up. More students are taking Advanced Placement classes, while math standardized test scores have soared. Thanks to a literacy program, three times as many books are being checked out from the Rogers library. The graduation rate? Eighty-six percent, on par with high schools in much more affluent neighborhoods. Yet the grant's initial three-year term ends in only a few days. Spokane Public Schools' preliminary budget sends $280,000 toward Rogers to keep the extra half hour of class time and a few teacher-administrators, but Rogers stands to lose its two-day head start and several staff positions. There's $1.3 million to $1.7 million left in the state's pool — funds that Rogers can apply for in order to get a one-year extension — but they'll be competing with up to nine other schools. Wyborney isn't worried, though: The school and the district are looking ahead, not only to raise test scores and graduation rates even higher, but to help kids long before they even step foot in Rogers' halls. "Our goal is to be in the 90s," Wyborney says of graduation rates. "We're not there yet, but we'll get there." 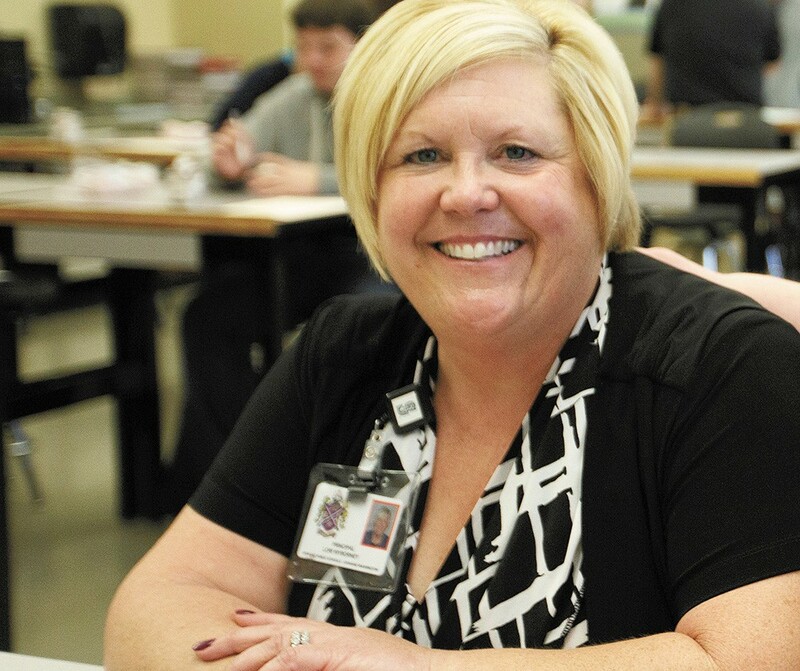 Intervention specialist Barb Silvey understands where her students come from. She's lived there. She graduated from Rogers nearly 40 years ago, and like many she teaches, grew up in economically depressed Hillyard. She knows all about poverty, eviction and family strife. "My mom was an alcoholic with a capital A," Silvey says. Of Spokane's high schools, Rogers has the highest rate of low-income students — three out of every four qualify for free or reduced lunch — special education students, and students without English as a primary language. The impact on education is profound. "When we say, 'Go home and do your homework,' sometimes there aren't any light bulbs [at home]," Silvey says. As a 30-year veteran of Rogers, she's seen countless experiments to fix the school: pooling high-risk students into the same classrooms, grouping kids by career path, even dividing the school into separate, smaller schools. But she says none of it worked. When Wyborney became principal in 2010, everything changed. "She's pretty magical," Silvey says. "She has galvanized the staff, to all get on the dang boat and go in the same direction." Silvey says Wyborney had a no-nonsense style that told teachers she had their backs. Graduation rates took off even before Rogers got the grant. Some of that can be attributed to improved accounting and transfer tracking measures at the state and district level, but Silvey also credits Wyborney's refusal regarding any doubts from teachers about whether their students could succeed. This is the last week of school for seniors, Silvey says, and counselors and teachers are still pushing for seniors with five Fs to find a way to graduate. "They're not just numbers, now. They're kids," Silvey says. "And they're not just any kids. They're our kids." They can tell. Junior Robert Rucker, like plenty of his peers, dismisses ROW time, saying kids waste it chatting and texting. But he knows his teachers care about him and support him. "Everybody has the same goals for each individual student: to graduate on time," Rucker says. "They're not going to give up on you." Rogers continues to experiment: Special ed students have been moved to mainstream classes, and out-of-school suspensions have increasingly been traded for in-school suspensions. Suspensions are down 40 percent this year, and the school has partnered with Youth For Christ to give suspended students a place to go. For all the changes, investment and inspiration, one important measure has barely budged: reading and writing standardized test pass rates hover, stubbornly, in the 70th percentile. Principal Lori Wyborney is proud of how far Rogers has come, but believes considerable work remains. "You don't survive in the world without [reading and writing]," Wyborney says. "You can't even drive a damn car without that." That's the next focus. Inspired by the runaway success of Brockton High School in Massachusetts, Rogers plans to infuse reading and writing into nearly every subject next year. In trigonometry class, for example, students may write essays about mathematicians from the 1600s. Yet any literacy efforts start with a handicap: Some Rogers freshmen enter reading at a third- or fourth-grade level. Academic failure, in other words, starts far upstream, at the elementary and middle school tributaries that feed into Rogers. "I think the answer to the ninth grade actually lies in the seventh grade," Wyborney says. Just a few blocks away from Rogers, city leaders and district administrators gathered in the Garry Middle School library last month for an announcement: Eight local businesses and foundations had pooled $400,000 to fund the Hillyard Youth Collaborative, made up of Spokane Public Schools, Gonzaga University, Washington State University, Communities in Schools, and the Boys and Girls Club of Spokane County. The group aims to find the 200 Garry and Shaw seventh-graders most in danger of never graduating and give them tailor-made interventions. Even in middle school, students flash warning signs — a few days missed at school, an F in a single class — that they'll someday drop out. "I think we've been waiting too long [to intervene]," Superintendent Shelley Redinger says. With the help of this grant, a case manager at the school could identify a student at Shaw, for example, with a serious attendance problem. "We know that mentorship has an impact on attendance," says John Traynor, a Gonzaga education professor and co-author of the grant. "That student could be lined up with a Gonzaga mentor. That Gonzaga student could be checking in with that [Shaw] student, to determine, 'Are you going to school? What's keeping you from school?'" That mentor, he says, could connect the kid with the afterschool or weekend Boys and Girls Club program, and keep in touch with her when she enters high school. At the elementary schools that feed into Shaw and Garry, teachers already are talking about getting involved as well. To Wyborney, that's the ultimate secret for schools: Early on, learn about students and their families, pile on support and keep at it for the next 12 years.